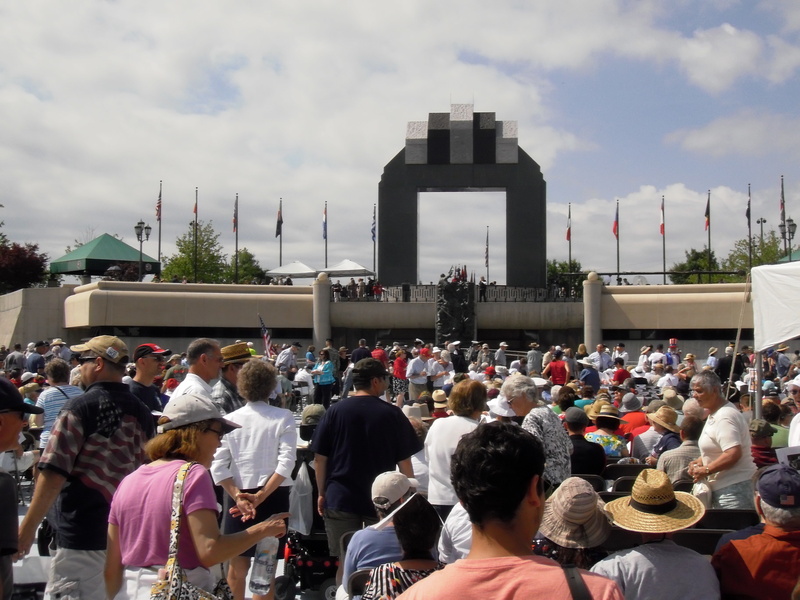 The crowd gathers beneath the Memorial Arch awaiting the 70th Anniversary Commemoration. What made the service so powerful, however, was that the participants “spoke.” Sixteen people read the words of the men and women who participated in the invasion. Their words were humorous, poignant, sad. 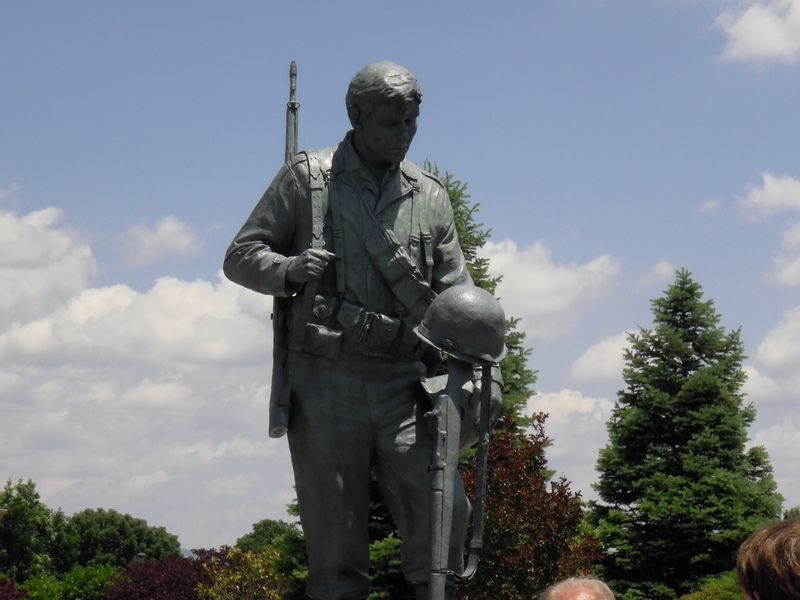 The very first voice was that of PFC George Alex of the 82nd Airborne. “I was 19 and afraid,” he wrote. The crowd felt his fear even 70 years later. Sales saw his captain, then his friend and sergeant get cut down when the ramp of the landing craft dropped onto the beach. When it was his turn to run out, the ship heaved in the turbulent surf and he was thrown off to the side and into the water, which made him the lone survivor among the 30 men in that Higgins boat. When he got ashore,his friend the sergeant was lying wounded, but propped himself up on his elbows and called to Sales for help. A sniper shot him through the head. Robert Sales knew he was next and put his head on the sand and waited . . . Perhaps, the most poignant statement of the day came from Mrs. Sales who said, “On this day, of all days, we are all together, in spirit if not in body.” I was happy to be wearing sunglasses. 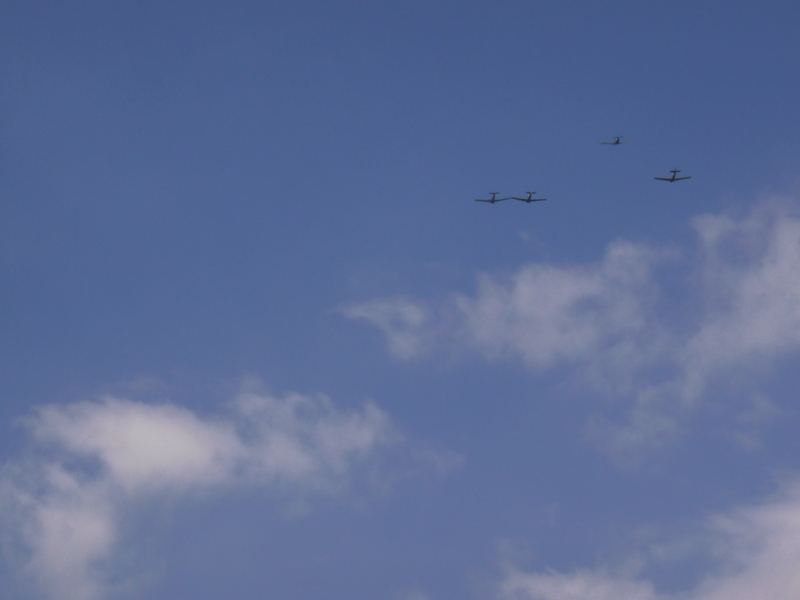 The final flyover: missing man formation. Well … you already know how deeply I feel connected to this very sad, but now exalted day of days … not when I was a child, of course, but once I hit adulthood. I am forever emotionally linked and greatly revere this incredible day. Bonnie, you really need to read The Bedford Boys and then come visit this place. It will talk to you in a meaningful way, if you listen. I’m sure that it will … considering my connection to it. watching some 25,000 fans come to their feet with thunderous applause. Gary Thorne interviewed him also, and after that, everything else that happened during the game faded by comparison. Thanks for being in Bedford, and for sharing your special weekend with us. Don, you are welcome; I appreciate your words because I felt very strongly that I was there representing ALL of my friends who could not attend. I can’t think of anyone I know who would not want to thank those men for what they did. I’ll have a final reflection in a day or two. I almost needed sunglasses just reading this. Off topic and certainly not to critical, but “Gov Tim Kain”? I guess you meant “past” gov T.K.? Indeed, although I think the title is permanent once you hold the office. Good thing the power is not!